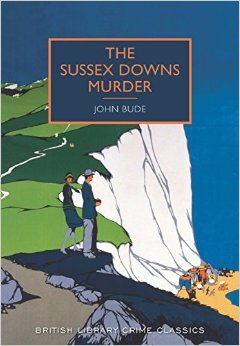 “The Sussex Downs Murder” features Inspector Meredith, who also did the sleuthing in the Lake District. He’s been transferred south, along with his wife and brainy son, and is applying his solid, reliable detecting qualities to local cases – and the murder that turns up here is a strange one! Brothers John and William Rother live together in a farm in Sussex, along with William’s wife Janet. All seems idyllic until one day John sets off on a trip to Harlech for a holiday – but never arrives. Instead, his car is found abandoned not far away; there are blood stains and signs of an attack; and then bones are discovered nearby and it seems that there is a murder to investigate. But who is the major suspect; both William and Janet come under scrutiny, as the latter was seen to be getting a little too friendly with her brother-in-law. Was William jealous or had Janet had enough of the intentions of John? However, what appears to be a straightforward case is anything but, and it takes all of Meredith’s ingenuity to get to the bottom of things. TSDM was another wonderful read from the British Library collection, and they really should be applauded for saving these works from obscurity. Meredith is an appealing character, persistent and methodical, and would be a very reassuring detective to have around in a crisis. 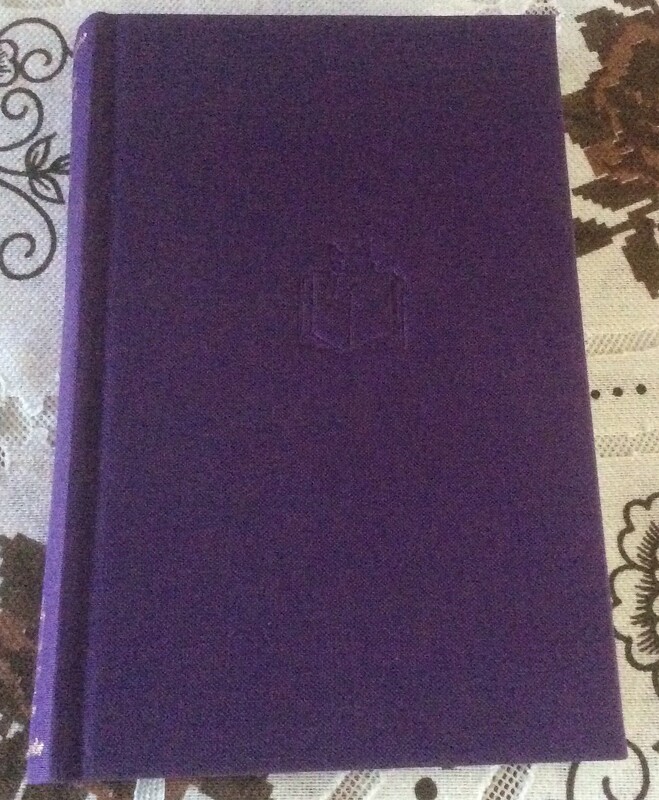 And the plot’s a clever and inventive one, though I have to confess up front that I got the major twist (and it is a major twist) very early on in the book. Bude plays fair with his readers, and if you have a reasonable amount of experience with murder mysteries I think you’re in with a fair chance of working out the solution! I reckon, Mr. Barnet, that you should let your readers know just as much as the police know. That’s only fair. And one up to the reader who can outstrip the police and make an early arrest. Not guess-work, mark you, but a certainty based on proven facts. That’s only fair to us because we can’t arrest a chap because we think he’s guilty. But this didn’t spoil my enjoyment of reading the book at all, and there’s great pleasure to be got from the setting, the plotting and watching Meredith reach his conclusions. Bude adds a nice little extra element in the form of Aldous Barnet, an author friend of William Rother’s, who observes the case with a somewhat professional interest. Bude is not averse to letting his sleuth have a little dig or two at the more fanciful fictional detectives; Meredith eschews gimmicks and goes for solid, workmanlike detection, and certainly succeeds here in tracking down the solution. So another lovely find from the British Library Crime Collection – very much my go-to place if I want a comfy, classic, non-gory murder mystery. I keep coming back to Tove, don’t I? Those fluffy little creatures the Moomins, with their quiet wisdom, are very appealing, and I guess I’m trying to make up for lost time by reading books I should have read as a child, or at least read to my own children! 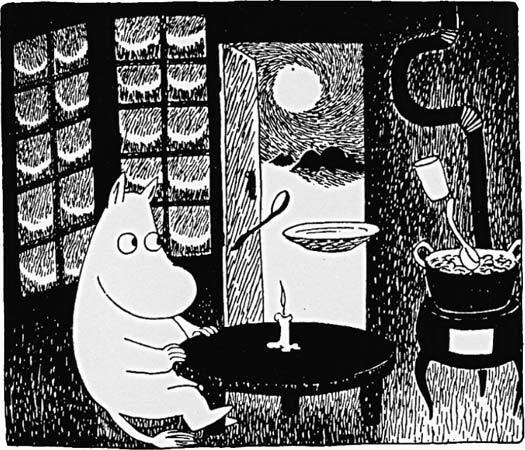 Of course, being an adult reader, I do seem to see subtexts all the time… The life of the Moomins is often strange and unsettling, with little permanence and an ever-changing cast of original little critters; and this volume is no exception. 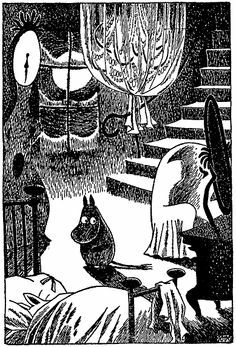 It is winter time in Moominvalley; the Moomins and all their friends are cosily hibernating when suddenly Moomintroll awakens. The valley is covered with snow, which he’s never seen before, and even though the family stay slumbering, Moomintroll finds it impossible to get back to sleep. Along with the irresponsible and irrepressible Little My, he sets off to explore the winter world, a very different one from his usual one. I found that this book had surprising depths; Moomintroll is obviously isolated, separated from his family by their apparent inability to waken, he encounters many strange new peoples and comes across unexpected dangers. And many of his new friends and acquaintances are vulnerable, needing to raid the jam store to survive the winter. Then there is the large-than-life and very hearty Hemulen, who tries to get all the creatures to get involved in his winter sports when all they’re really trying to do is get through the cold days and nights. In many ways, Moomintroll seems a little lost, despite his usual practicality; and it’s the new character Too-ticky who appears to be the sensible one, obliquely helping him survive through the cold and deal with threats from The Groke and The Lady of the Cold. And despite the rather threatening environment, Moomintroll has some wonderful new experiences and ends up reunited with old friends and family, as well as plenty of new ones. 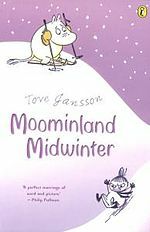 “Moominland Midwinter” turned out to be one of the most thought-provoking volumes in the series so far; I’m not sure how I would have reacted to it as a child, but I loved it as an adult! Almost? Yes, almost! The reason being that I hadn’t quite appreciated that “A Winter Book”, one of the earliest TJ adult books to be available in translation, is actually a compilation of pieces from her other collections! And obviously since it came out in 1998, many of the volumes the pieces are drawn from have been translated and published by Sort Of books. So when I came to open “A Winter Book”, being very much in a Tove frame of mind, I realised that a great deal of it consisted of pieces from “A Sculptor’s Daughter” (as well as other volumes). I’ve read that particular book too recently to read it all again, so instead I just picked out the titles that were new to me and read them! And very wonderful they were, too…. All were very different and all a delight! 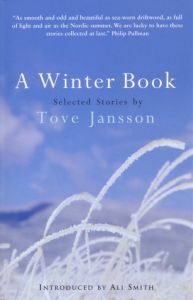 “The Boat and Me” tells of Tove’s venturing out on a voyage round the coast all on her own; “Messages” is (I presume) a telling collection of messages left on a phone answering machine – some from her partner, some from complete strangers; “The Squirrel” is a compelling tale of an ageing woman living on her own on an island, and her odd relationship with the creature of the title; “Letters from Klara” reveals much about the life and character of a woman through the (not-so) one-sided view of her correspondence; and “Taking Leave” is a poignant piece about Tove and Tooti taking leave of the island for the last time, as they realise that they are physically unable to cope there any more – and Tove unaccountably develops a fear of the sea. All of these short fictions are wonderful in their own way, but I think it was “The Squirrel” that made the most impact. 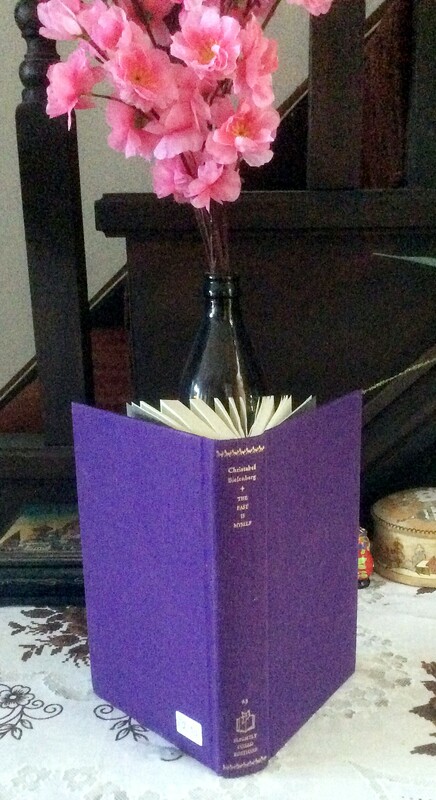 It’s strange and rather absorbing; the woman on the island is isolated and dependent on regular tots of madeira wine. She’s drawn to the squirrel yet somehow doesn’t wish to become involved with it. The squirrel itself has floated onto the island on a small piece of wood and the two have to find a kind of co-existence, respecting each other’s space and sorting out what they need to survive without threatening each other. It’s a poignant and moving piece of writing and a stand-out for me. I keep banging on about what a marvellous short story Jansson is, but all I can do is reiterate it again. She’s a master of the art and I’m so glad that I discovered her work – if you love good short story writing (or just good writing!) she’s definitely for you. … which is quite apt, given one of the titles of the book! Yes, the gradual weeding out of unwanted volumes continues and today I took another seven off to donate. I’m actually finding it relatively unpainful so far, although I haven’t yet got onto the books which it will be an emotional wrench to part with. But I figured if I keep taking in a few at a time they will gradually thin out to the ones I *must* keep, and seven fairly large book is all I could carry. 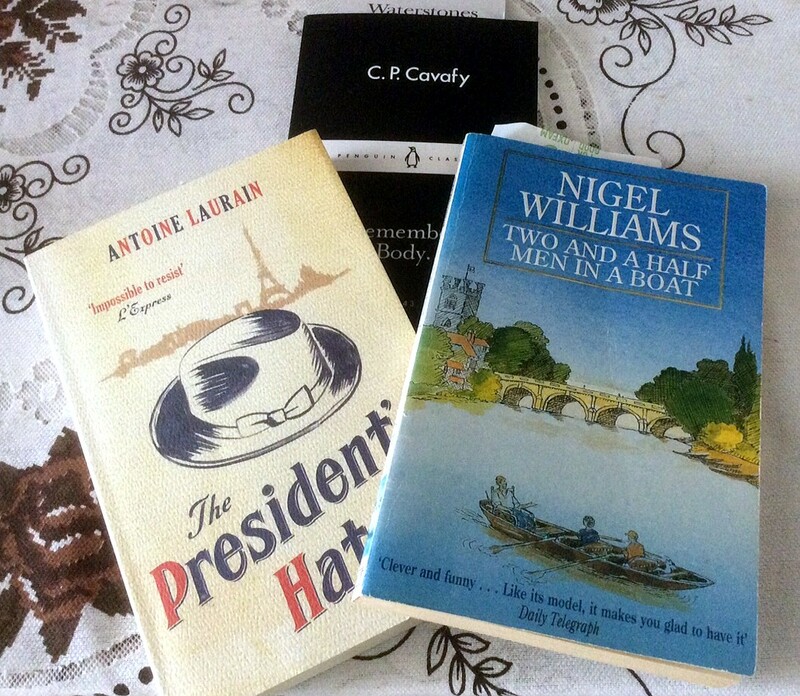 I *had* planned to buy the half a book – the Cavafy Little Black Classic – as his name keeps cropping up and then I read this excellent post about his poetry, and figured I could commit 80p to discovering his work! But the other two were charity shop finds. As for the Nigel Williams – again, he’s an author I keep circling, thinking I really should read “The Wimbledon Poisoner”. This, however, is non fiction – an attempt in the 1990s to recreate “Three Men in a Boat” (for which I’m a sucker) and the first page was funny enough to get me snatching the book up (and being quite surprised that it was only 99p). “Sculptor’s Daughter” came out in 1968, by which time Jansson was a household name because of her creation of the Moomins. The book is a collection of short pieces firmly rooted in the world of a child; growing up in Finland, the girl inhabits her father’s studio, and an island near the sea, and the imaginative land that forms part of every child’s developing mind. Is this fiction or autobiography? That’s often a hard question to answer as so many novelists use their lives in their work, but it’s particularly difficult in the case of Jansson where the parallels are so striking. The book is subtitled “A Childhood Memoir” and I think it’s best to read it as a fictionalised portrayal of Jansson’s childhood; because the stories here are not simply straightforward recollections. Instead, she gets inside the mind of a child, recreating the wonder and fear of the world around her, and the perceptions of things which are seen quite differently from the way an adult would. 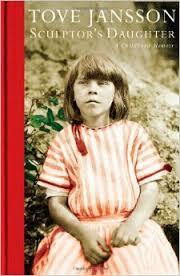 As with all of Tove Jansson’s work, this is a compelling read. She had a unique voice and viewpoint, and whatever she was writing about was very individually hers. There are vivid passages of adventures rowing out to sea, hiding from imagined dangers and the complex relationships between children, all of which will remain with me. One of the strengths of the book is its portrait of Tove’s parents, the sculptor Viktor Jansson and the graphic designer/illustrator Signe Hammarsten-Jansson – let’s face it, it was inevitable Tove would be creative! Her parents come vividly to life through their daughter’s eyes, with their bohemian lifestyle and uncompromising way of living, and the book acts as a wonderful tribute to them. Jansson went on to write many more adult works, several of which I’ve read, and with a lot of them there is a sense that again she was using her life in fiction. This is no criticism, because I love her stories; and it’s fascinating to see how she translated the people in her life into her work, even extending this into her Moomin stories (I assume that the Moomin family reflect her own, and certainly Too-Ticky was based on her life partner Tuulikki Pietilä). There’s always a lot more depth in Jansson’s writing that might appear at first, and her characters go through all sorts of vicissitudes, just like all of us in real life. 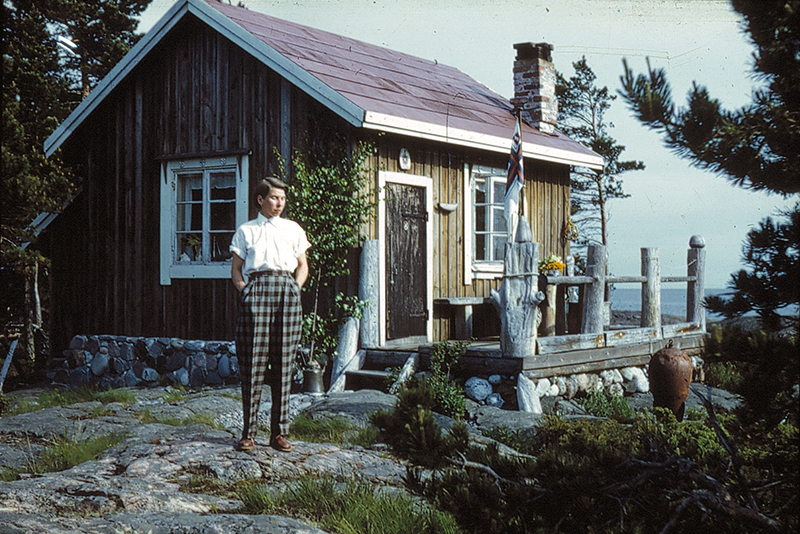 In some ways, it’s hard to review Tove Jansson’s work – I could just keep throwing out superlatives and saying how wonderful she is, and pinning down her brilliance is not easy. She’s a writer who gets to the essence of things, making you see the world anew which is a real achievement. 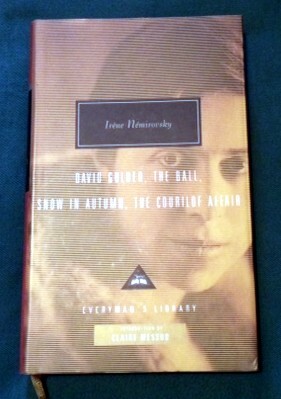 And very fortunately, there are still works of hers I haven’t yet read!